A recent genetic study, ranking 34 primitive cattle breeds by their closeness to the extinct aurochs, provides additional scientific backing to the Tauros Programme that aims to breed a suitable replacement for this lost species. Genetically speaking, the Pajuna breed is the closest to the original aurochs. One analyses (NEI genetic distance) calculated the distance between the analysed breeds in comparison to the one analysed original aurochs. It was found that four of the breeds that play a major role in the Tauros Programme are in the top 10 of the NEI list and six of our breeds are in the top 15. The research confirms that certain so-called Podolian breeds (from Italy and the Balkan countries) show a close relationship with the aurochs. These results are based on the analyses of a greater number of aurochs individuals (since it’s far easier to reconstruct these small fragments of DNA, than to reconstruct the complete genome). New information also shows that Iberian breeds in general show a closer relationship to the aurochs. The leading practice in the Tauros breeding programme so far – combining Iberian and Podolian breeds with aurochs-like physical properties – is being confirmed by the combined results of the study. However, at this time the genome of only one specimen of the aurochs has been fully sequenced (autosomal DNA), so new additional information could lead to adjustments of this conclusion. It is therefore that the breeding programme still uses a rather wide variety of crossings (with the selected breeds). The research also identified a number of breeds that are genetically close to the aurochs, but are not yet used in the Tauros Programme. The reason for this was that by phenotypical features (the way the animals look) better breeds were available. Future studies will determine if some of the newly identified breeds should be included in the programme. Future research also needs to dive deeper into the genetic features of the aurochs, to be able to identify specific genes for domestication, and thus getting more ‘grip’ on genes that could be crucial for the opposite direction – the rewilding of the species. More fully sequenced specimens of the aurochs that cover a substantial part of the European continent are needed, to be able to get an idea of the genetic diversity within aurochs. On the short run, the results of the research can be used to develop practical guidelines as the base for future selection of breeds in the Tauros Programme. 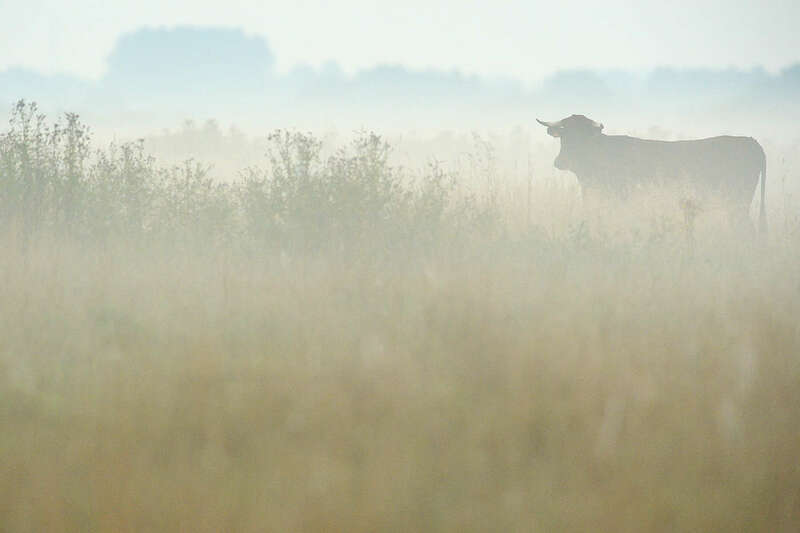 Rewilding Europe and Taurus Foundation have established five breeding sites for the Tauros programme: in Portugal, Spain, Croatia, Romania and the Netherlands. Apart from the breeding programme, this includes pilots for natural grazing in these rewilding landscapes. A full summary of the scientific study is available here. Authors of the study are Ronald Goderie (Taurus Foundation), Johannes A. Lenstra (Utrecht University, Faculty of Veterinary Medicine), Maulik Upadhyay (Wageningen University), Richard Crooijmans (Wageningen University, Animal Breeding and Genomics Centre) and Leo Linnartz (ARK Nature). The study was funded by Dioraphte Foundation (The Netherlands). The Tauros Programme is an initiative of the Taurus Foundation, in close cooperation with Rewilding Europe and ARK Nature. The programme aims at rewilding bovines and wants to develop a credible replacement for the extinct aurochs, called Tauros. The Tauros will be based on the best available scientific knowledge, involving archeo-zoology, history, ecology, ethology and genetics.